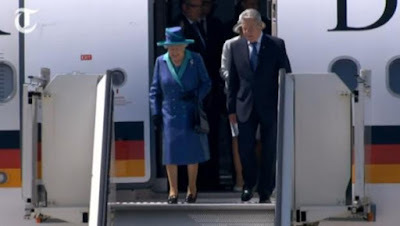 On the second full day of their state visit to Germany, The Queen and The Duke of Edinburgh visited Frankfurt, where they toured St. Paul's Church and attended a lunch hosted by the Minister-President of Hesse at the Römer. For more: Telegraph video and article, Zimbio gallery. Okay, I guess we really are reusing our Ascot brooches. I can't lie, I would have preferred something other than the Shamrock Brooch on this peacock-inspired Angela Kelly outfit. 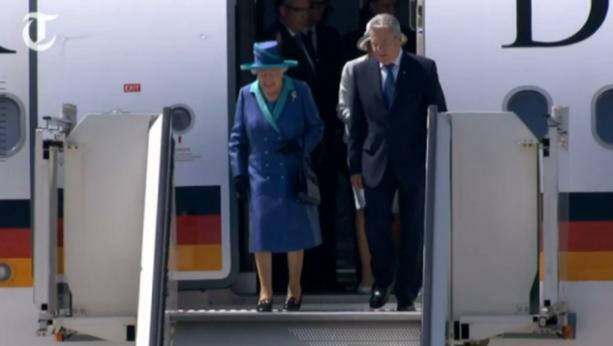 But brooches aside, it was a good day in Frankfurt, with huge crowds turning out to greet the royals. Prince Philip even got to reunite with a couple of his relatives, the Margrave of Baden and the Landgrave of Hesse.